Event includes the 1K McDonald’s Go Active! 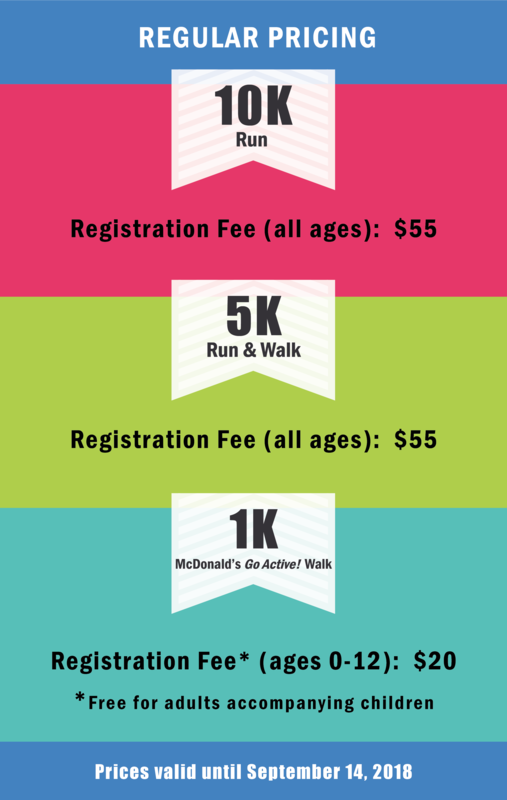 Walk, 5K walk/ run and a 10K run, for the whole family. 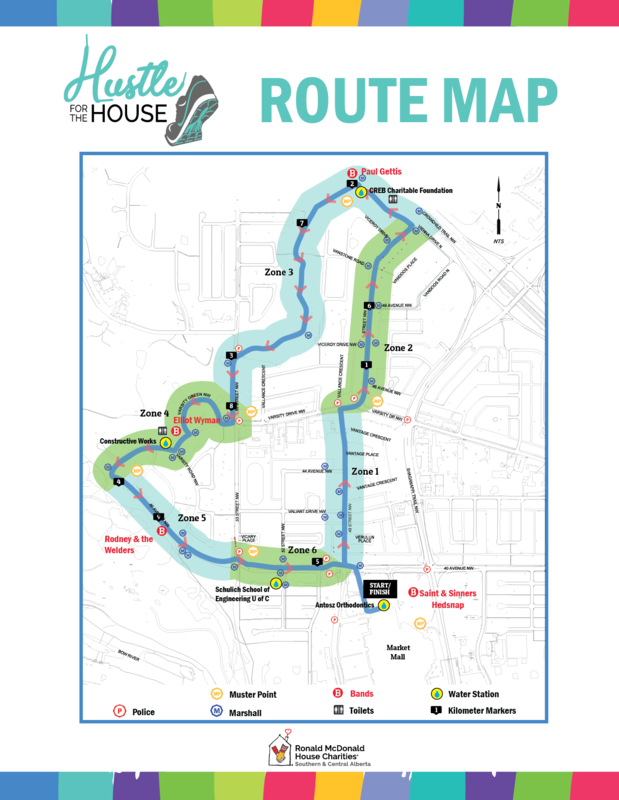 Route options include the family friendly 1K McDonald’s Go Active! Walk, 5K Walk or Run and the 10K Run. Join us at the Family Festival for food, bouncy castles, caricature artists, balloon twisters, petting zoo, face painting, photo booth and a live entertainment. You can look forward to more activities, entertainment, and food trucks for you and the whole family to enjoy. Hustle for the House is an important fundraiser for Ronald McDonald House Charities® Southern & Central Alberta. By registering for the run, fundraising, and enjoying the amazing activities, you directly impact families of children requiring vital medical treatment in Calgary. Thank you for helping us provide these families with a home away from home when they need it the most. Our yearly family fun-run has undergone an exciting re-brand! We are excited to announce that we will be adding a new route, theme, and a bigger and better festival area to this year’s run! You can look forward to more activities, entertainment, and food trucks for you and the whole family to enjoy. The projected revenue for this year’s Hustle for the House is $210,000 with projected expenses of $50,000. Funds raised will directly support the operational cost of Ronald McDonald House® Southern Alberta operated by Ronald McDonald House Charities Southern & Central Alberta #11915 7402 RR0001 incorporated in Calgary, 1985. ONLINE REGISTRATION CLOSED FRIDAY, SEPTEMBER 14 @ NOON. The toll of having a sick child in the hospital and being away from home quickly adds up. That's where Ronald McDonald House comes in. Our families pay just $12/night to stay at the House while our generous supporters help cover the remaining $184/night it costs on average to operate each family suite. The House also provides stress relief and emotional support to families through recreational activities and opportunities to speak with other families in similar situations. By collecting pledges, you help keep families close during one of life's most stressful times...when a child is in the hospital. The more pledges you get, the more chances you have to win awesome prizes and incentives! Register today for Hustle for the House and you'll get your very own customization Pledge Page to share with your friends, family and colleagues. Or, if you prefer, collect pledges manually using our Printable Pledge Form. We invite you to bring your pets along and enjoy the run together! We just ask that all pets remain on leash and any pet waste must be picked up immediately. Thursday, September 13 | 5 p.m. - 8 p.m.
Friday, September 14 | 5 p.m. - 8 p.m.
Saturday, September 15 | 10 a.m. - 4 p.m.
We ask that each team designate ONE (1) team member to pick up ALL Race Packages for your group. These include your bibs and chips. Thank you for participating in Hustle for the House in support of Ronald McDonald House Charities Southern & Central Alberta!